Whether you are looking for a large or small batch, this silky hot chocolate will have you feeling wonderful in no time (cold or no cold!). Scaling becomes easy with a Recipe Conversion Calculator, and you can scale accordingly based on the size of your jar, or even make just a single cup. Our version makes about 4 servings. 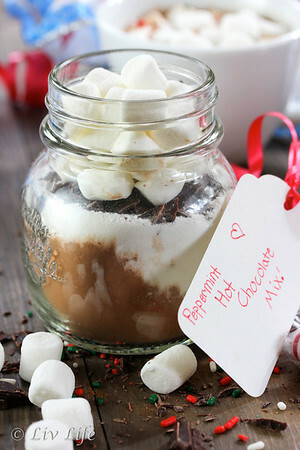 Layer the cocoa, sugar, cornstarch, chocolate and marshmallows into a jar and seal. Include an recipe card with instructions, along with either a few candy canes, hard peppermint candies or a small bottle of peppermint extract. Alternatively, pour ingredients into a bowl and stir to combine, then place into a jar for gift giving. This allows the user to use a few spoonfuls in place of the whole batch. 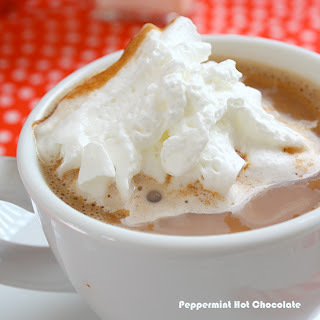 To prepare Peppermint Hot Chocolate, add 4 cups of milk (or milk alternative) to a saucepan. 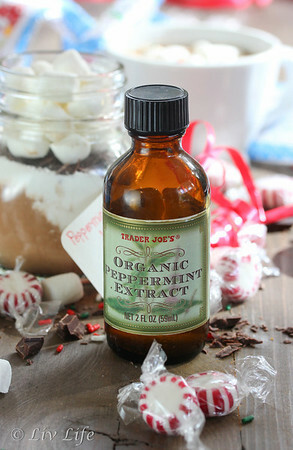 Heat over medium heat, for a few minutes and crush 1/4 cup of peppermint candies. Add the ingredients from the jar along with the crushed candy cane, whisking until dissolved. Heat to desired temperature and serve. Alternatively, give a small bottle of peppermint extract in place of the hard candies. We add 1 tsp of peppermint extract to 4 cups of milk. Wow, that looks absolutely delicious. I don't blame Liv for piling on the whipped cream too....dilutes that chocolate flavor (snicker). Sorry, I couldn't resist. 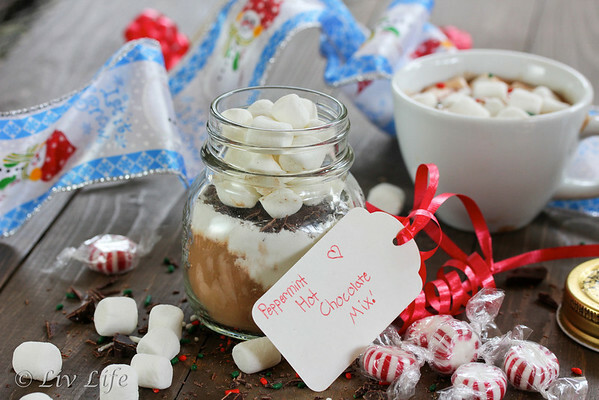 I made peppermint hot chocolate mix last year as well...it really is a fun gift! This is SUCH a cute idea! I love doing things like this, people seem to really enjoy it! This looks wonderful. I pinned it to my Food Gifts pinboard. What a great treat on a cold winter night. Your Liv knows what's good! What a wonderful gift idea! I'd like to make many of these for my friends at work! We've used all sorts of different sizes!! I've used old spice jars, jam jars, and my daughter made a big huge 3 cup size one for a favorite girlfriend. Use the Recipe Conversion Calculator to adjust sizes! The one in this photo held about 1 cup, which was about 4 servings... I hope that helped! !